A Guide To The Breastfeeding Diet For Mums - Eat Right, Right Now! Home > Advice > Is there A Specific Breastfeeding Diet All Moms Should Follow? 21 May Is there A Specific Breastfeeding Diet All Moms Should Follow? A breastfeeding diet is a common query on the lips of a lot of new mums. Are there specific things you should be eating? Are there foods you should be avoiding like the plague? Especially for new mums, knowing what to eat whilst breastfeeding can often be a thought provoking topic. Don’t let your head get the better of you, read on below now to see just what your diet as a breastfeeding mom should look like! If you are deathly allergic to something, but the ultimate diet to breastfeeding suggests you need to eat this thing for your baby to survive, don’t do it. As long as you are leading a healthy lifestyle and consuming a nutrient rich diet which is suited to your body, there really is no right and wrong when it comes to eating for breastfeeding. Therefore, we can’t actually offer you a set meal plan for breastfeeding success, rather, offer helpful tips to help you produce enough milk whilst not compromising your own health. Contrary to popular belief, carbohydrates are actually good for your body in terms of sustenance. You need to include healthy carbs, fats and proteins into your diet to keep you fuller for longer periods of time. However, when choosing your carbs, opt for complex carbohydrates such as wholegrains, fresh fruit and vegetables. Avoid overly processed carbs and starches as these are generally chock full of unneeded sugars. Complex carbs offer you more nutrition than their processed counterparts. Plus, eating a balanced diet from all food groups will help your body absorb all the vitamins you and your baby need over time. Just like your carbs, you want to choose the good fats over the nasty ones. Good fats come with the terms mono and polyunsaturated. These can be found in things such as avocado pears, olive oil, salmon, nuts, olives and seeds. These kinds of fats are known as the healthy fats of the world. Fats you want to limit are saturated fats which are found in things like highly fatty meats such as pork, and completely rule out trans fats which is the unhealthiest of the lot. Trans fats are the fats found in processed foods such as cakes, butter, pies and fast food. Whilst unhealthy fats are bad for your body, too much fat consumption may also compromise the fat content of your breastmilk. On top of including these into your diet, always try and opt for organically grown produce. Also, eat a large variety of fruits and vegetables to lessen your chances of ingesting large amounts of pesticides. When eating meat, once again opt for organic produce. Also, remove the skin and cut off any unnecessary fat as fat stores hormones. Breastfeeding can take up a lot of your body’s natural water. Therefore, to avoid dehydration, be sure to drink a lot of water on a regular basis on your breastfeeding diet. Looking after your body is your number one priority, because if you are unhealthy, exhausted or dehydrated, you wont be able to produce adequate milk for your baby. 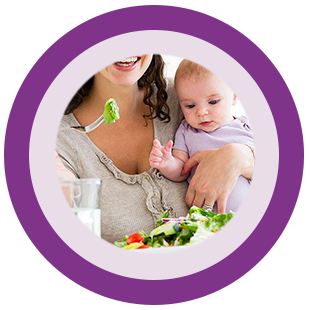 Whilst breastfeeding, you may find that you need to eat more regularly, as well as consume bigger portions. Don’t be alarmed, this is completely natural. Your body is doing a lot of work producing breast milk for your baby, therefore, you may need to eat a little more than you did prior to breastfeeding. When breastfeeding, always keep a healthy snack, such as a handful of nuts, and a bottle of water close by. Be sure to get all of the assistance you need whilst breastfeeding by signing up for the Breastpumps and Beyond Newsletter today. Also, take a look at our amazing products on offer for you now. Get the right pump for your body and keep your baby healthy and fed always.